Not too often am I reminded of the many possibilities of today. What is today for most of us? It usually consists of running errands, doing our best to get things done, and surviving to see tomorrow. But in all of our busyness, we sometimes forget the importance of today. The precious gift that we are given that we (including myself) take for granted. We usually tend to fall into the habit of talking about our dreams and goals, things that we will do in all the tomorrows that we have planned. It’s great that we have goals, and dreams, but we cannot forget that today is as precious as the hope of tomorrow. We hope that tomorrow will come for us. We hope that we will have more time to make things right, to do things right–but we simply do not know what tomorrow will bring. What if Today Was Your Last Day? Last year I asked myself, How Would I Want To Be Remembered? It’s a running question in my home and one that I share all the time with my family. Do I want to be remembered as always out of the picture? Never having enough time with my family? These things will be the furthest from my mind. Instead, I know I will be asking, and hoping that I spent as much time with my family as I could. That I showed them love and how to love. That not everything we end up doing we like to do, but we end up loving to do it, because we love our families. Too often we get caught up in the soil of here and now. That we are so buried deep with our responsibilities that we do not take our heads out of the dirt and look around. What if today was your last day? Did you appriciate the gift of today? Stop and Truly Smell The Roses. There are people who are losing everything they have now due to storms. I have a bed to lay my head down tonight. My family is safe and sound. All over the news, I’m hearing about storms and tornadoes ripping through communities, and changing lives. Am I going to sit around and complain about how much I need to get done? Nope. I have to put things in perspective. I’m learning that I must be grateful and thankful for today. I can say we should let go of our past; that we should learn to forget and forgive (very important lessons) but I think letting go is more than just that. Letting go is letting it all go. Past, and future. Not counting the chickens before they hatch. Truly looking at our lives for what they are–here and now–and learn how to live. Every day is a gift, and I will be thankful for each one that I am given. Do you find yourself taking things for granted? 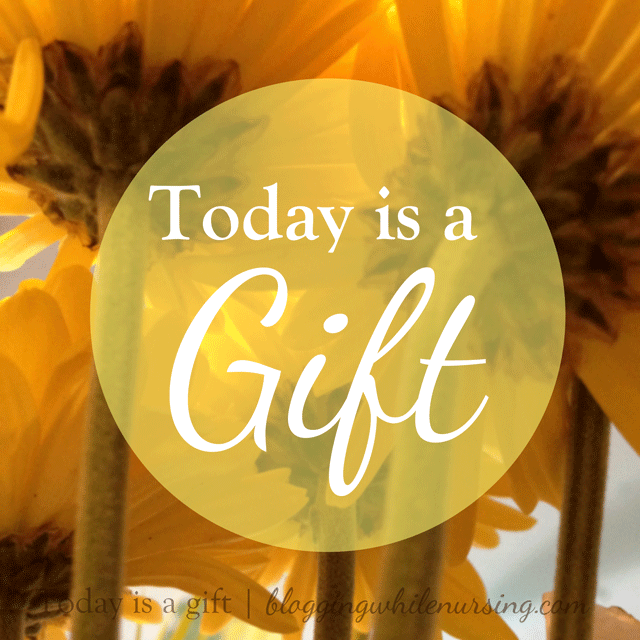 How often do you remember that today was a gift? What is something you are going to change starting today? 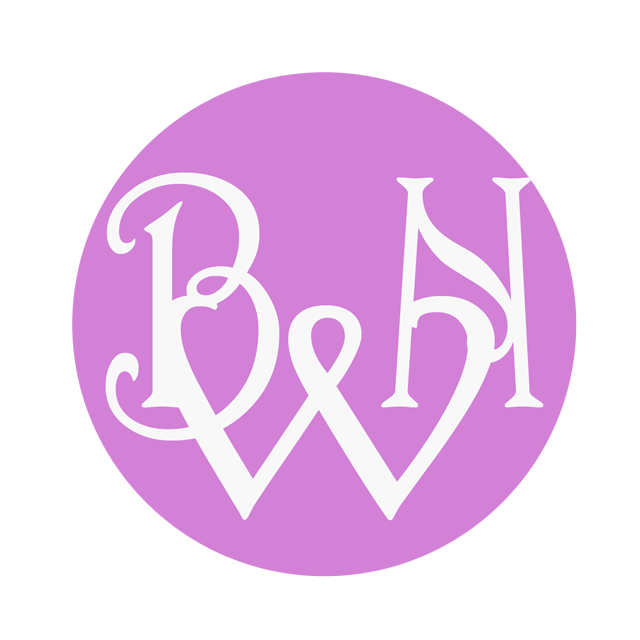 I am a writer, a thinker, a mother, a woman, AND a homeschooling mom. Everything rolled into one. I write about life, family, faith and love. Most importantly, I write about life's events and what lesson they teach. 19 Comments on "Today Is A Gift"
Letting go is so hard for me but when you let go you can be free. I want to be remembered for something or touch a life in some way and I am making it my mission to do that. This post was right on time because I feel some changes taking place with me. I’m right there with you Kita. I want to live a life where I touched someone in a positive way, that they will remember the joy I brought to them, just by being around. It’s so hard to let go, and so hard to remember to let go, but I think there is something beautiful in this season of being in our 30s. It’s truly understanding what makes us unique and living freely in it. No longer seeking validation, but living the way we choose to live. It’s a wonderful reminder. Thank you Kalley! Jeannie, your comment has left me in tears too! What your husband has done, and is doing–living a life worth living, is an aspiration that most of us are trying to do! I thank God that your husband is now healed, and also, through his actions and his life has touched you in a way that you sought change for the better. Thank you so much for sharing this with me and the rest of us. 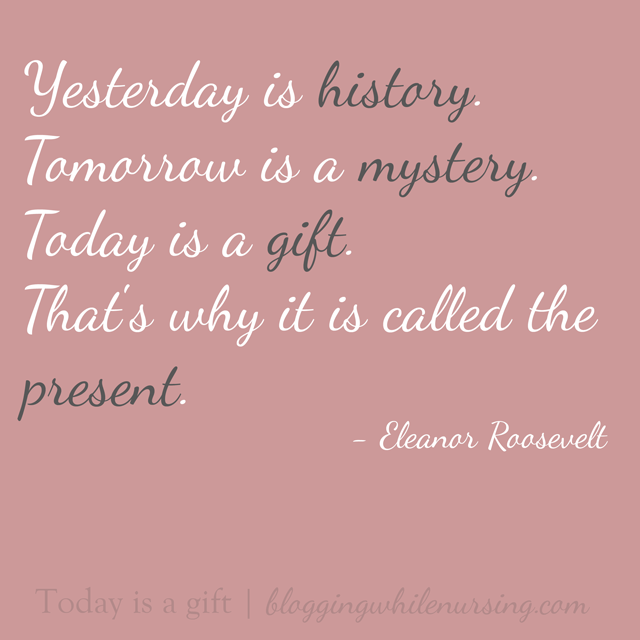 Such a great reminder to live in the present and cherish life and living now…not yesterday or tomorrow but now. Great to just stop and be reminded of today as a gift! Thank you! Thank you so much for stopping by Cathy! Hi Kalley C! I am coming over from Wanda’s link-up. My husband and I were just talking about this. It’s too easy to be scared by the future, and regret the past. I wish it was hard to do! Focusing on the ‘right now’ is the best thing to do, because I living it…right now. It reminds me of the Scripture passage where Jesus is saying tomorrow will have it’s own problems. Just deal with the now. That passage says it all! It’s so true, tomorrow will have it’s own problems. It’s harding living in the present, a lot of our our todo lists are things that we have to get done in the future. The best thing that we all can do is take everyday one step at a time, and not add too much to our plate that we forget to live. Thank you so much Kim & thank you for stopping by! You are so right, today is an amazing gift. When I pray I try to thank Him for all of the little things as well as the big things. Thank you for this beautiful and powerful post. I am so grateful for each day and the things we are hearing that are happening in the world are so deeply sad that we can’t not be thankful.. We are fortunate for the big and small things in our lives..
You are so right Cassandre, too many sad things are happening in this world. So many things that we do forget that everyday that we lived is on borrowed time. So very true Britnei! I think we tend to forget that the “things” that we are focusing are will still be here, but our families are the ones that matter the most. They are the ones that will miss us the most, and they are the ones that would be hurt by our loss. I tend to put the family first as well, and the things will come second. We never know when our breathe will be our last one, so make everyone of them count.